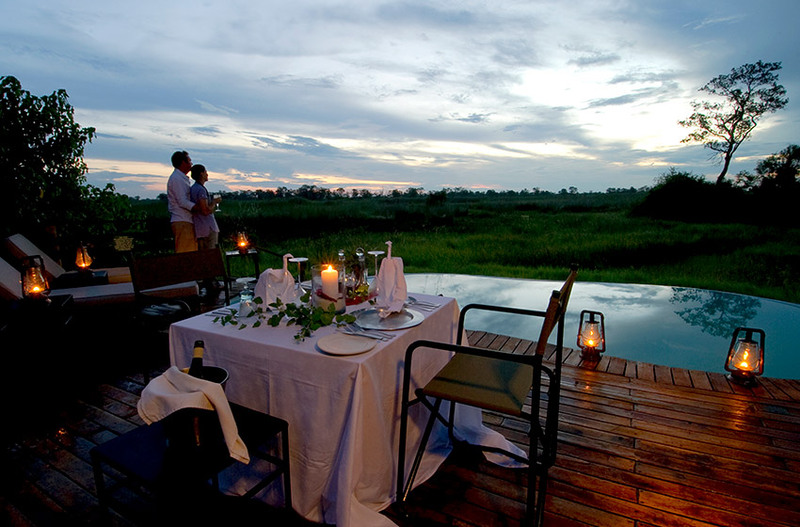 Set in a grove of trees, and surrounded by papyrus beds, Sanctuary Baines’ Camp is built on raised platforms high above the Boro River in a private concession bordering the Moremi Game Reserve. We encouraged the local community in Maun to collect cans, with a fee paid for every can, which were recycled to form the backbone of the camp’s structures. 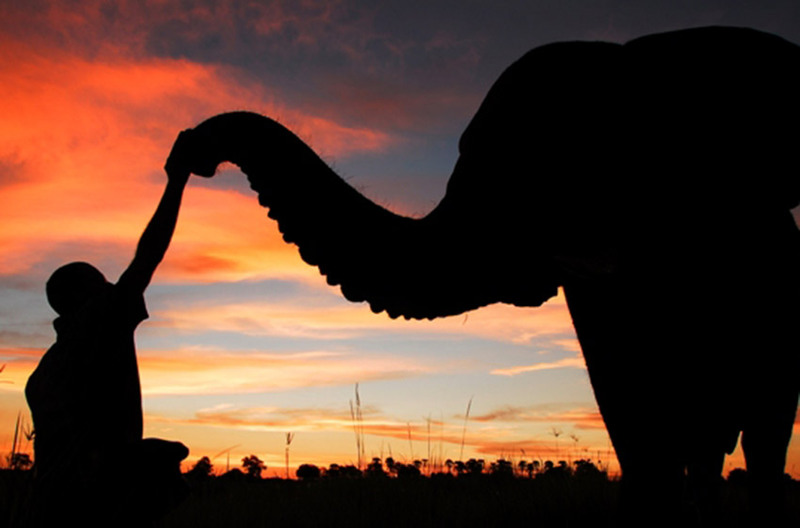 Baines’ is also one of only two camps to offer you the opportunity to walk with elephants. 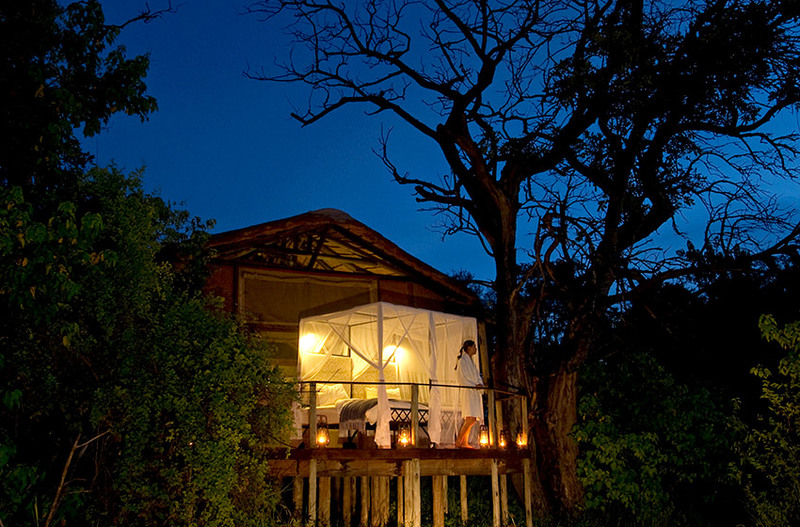 This is Sanctuary's smallest and most intimate camp, with only five luxurious suites. Set in a grove of trees, and surrounded by papyrus beds, this low environmental impact camp has been built using commercially grown wood and recycled tin cans. Named after the 19th century explorer and painter Thomas Baines, this is Sanctuary's smallest camp with just five suites. An eco-friendly property built using only commercially grown wood, with over 150,000 recycled aluminium cans incorporated within the walls to provide insulation. 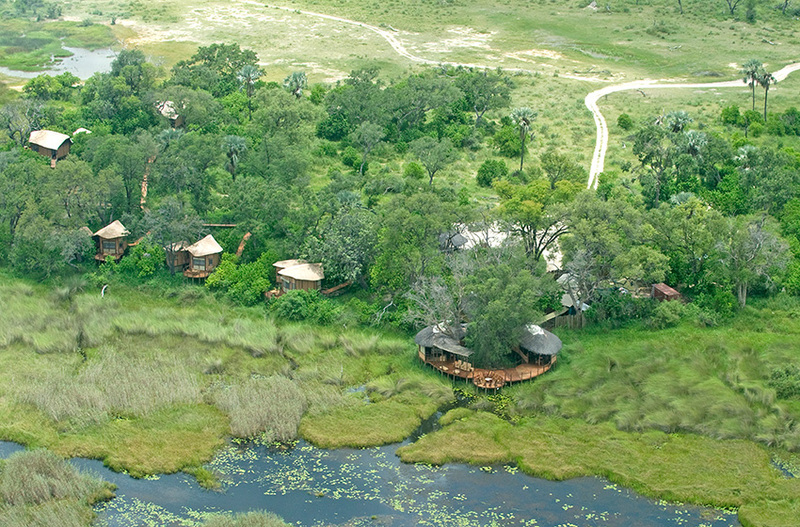 The camp is raised above the permanent water of the Boro River while wooden walkways connect the main areas and luxury rooms. 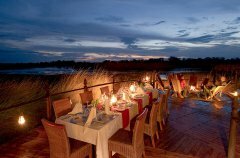 The swimming pool and the wide wooden deck that surrounds the main dining and sitting room is the ideal place to relax while observing the varied wildlife present here. 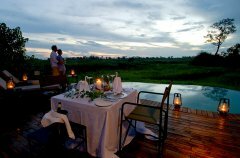 Watch hippos wallow at the edge of the lagoon that the camp overlooks, or see one of the many elephants who live in the area. 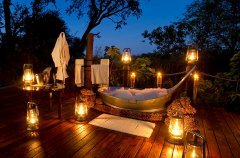 The five suites at Sanctuary Baines' are opulent and luxurious, with ensuite facilities and four-poster beds. 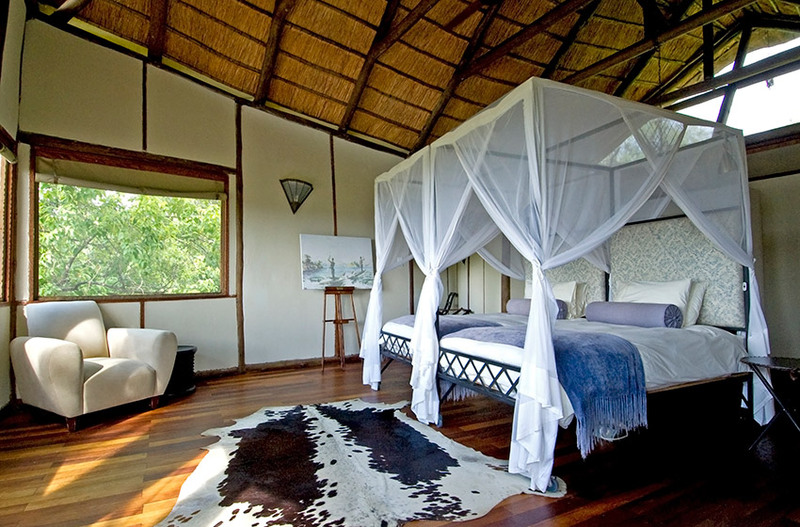 Traditional safari ceiling fans create a cooling breeze at even the hottest times of the year. 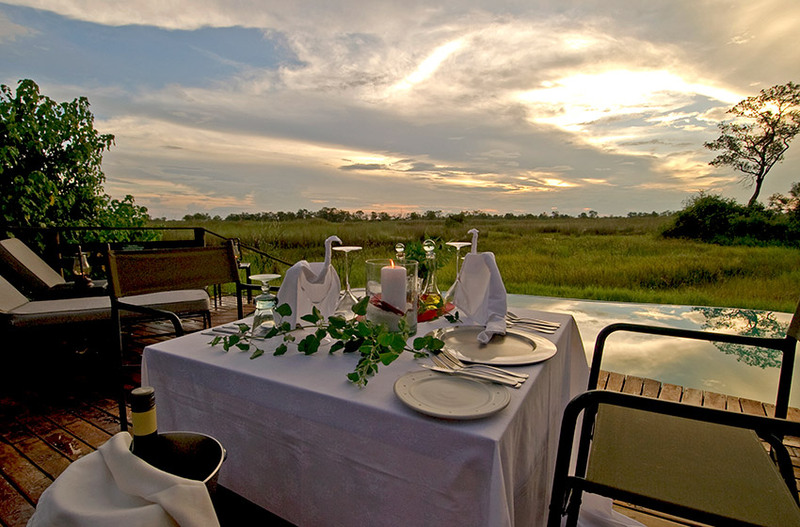 Should you wish, your bed can be wheeled out onto the private wooden deck for a night under the stars, overlooking the shimmering waters of the Boro River where hippo can often be spotted. Or take an indulgent soak under the stars on your own private viewing deck in our opulent star bath. At Baines' Camp, the sky's the limit. 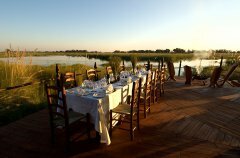 Sanctuary Baines' Camp prides itself on its personalised service and this includes your culinary preferences and needs. Please let us know how we could make your experience even more memorable. 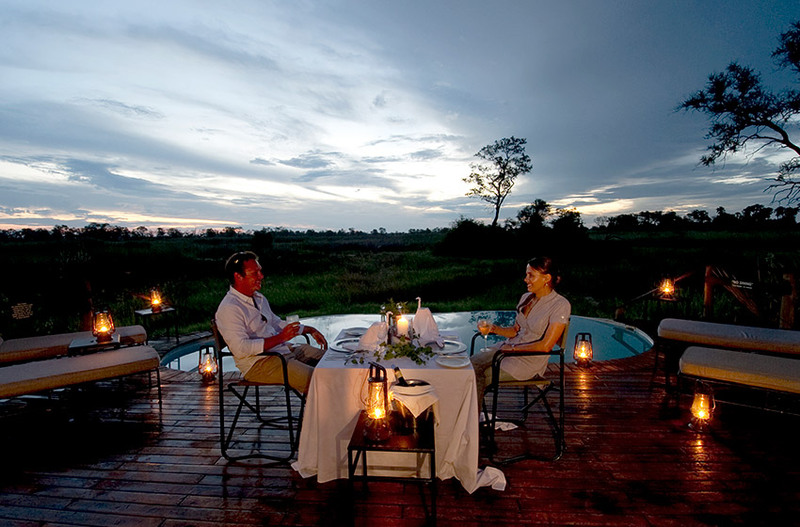 From delicious dining with spectacular views to sundowners drinks in the middle of the bush - Sanctuary Baines' Camp has so much to offer. Start the day with a delectable meal consisting of a full English and continental breakfast, before departing for your morning game drive. If you decide to experience our unique elephant interaction activity you will meet Jabu, Morula and Thembi and enjoy a secluded bush brunch in the company of these three gentle giants - now that is lunch with a difference. Elegant high teas are served in the afternoon just before departing for your afternoon game activity. It is often hard to believe that the chefs are able to make such delicious cakes, cookies and treats - all here in the middle of the African bush! On return, relax at the pool or sip on a cocktail on your private viewing deck before returning to the main area for your three course plated dinner. The additional charges listed are only a guide. Some charges may fluctuate daily and others are subject to change without prior notice. Please check at the time of booking. Intercamp flights are quoted on a ‘seat in aircraft’ basis inclusive of meet and greet service on arrival and airport tax on departure from Maun and Kasane Airports. Intercamp flights and road transfers can only be carried out during daylight hours and are subject to weather conditions. The timing and duration of flights and transfers may differ considerably depending on factors beyond the control of Sanctuary Retreats and operators involved. Early departures from lodges may be necessary to accommodate intercamp flight schedules. Luggage on intercamp flights is restricted to 20kgs per person in soft side bags. Walking with Elephants activity has a minimum of 2 guests and maximum of 10 guests; is subject to availability; minimum age is 9 years. Elephants are on leave between 15 January - 15 February on an annual basis. Private vehicle is subject to guide/vehicle availability and cannot be guaranteed. These rates are in US$ per person per night and include VAT. Rates are subject to availability and can be withdrawn without prior notice anytime at the sole discretion of Sanctuary Retreats. 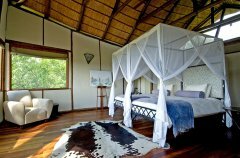 All bookings are subject to the Sanctuary Retreats trading terms and conditions. Travel insurance, boutique purchases, gratuities and all other items of a personal nature. Triples are subject to availability at time of confirming a booking. There is one guide room at each Sanctuary Retreats lodge or camp which can be booked at a rate of $180 per night, subject to availability. Long stay rates depend on duration of total stay and season of travel. 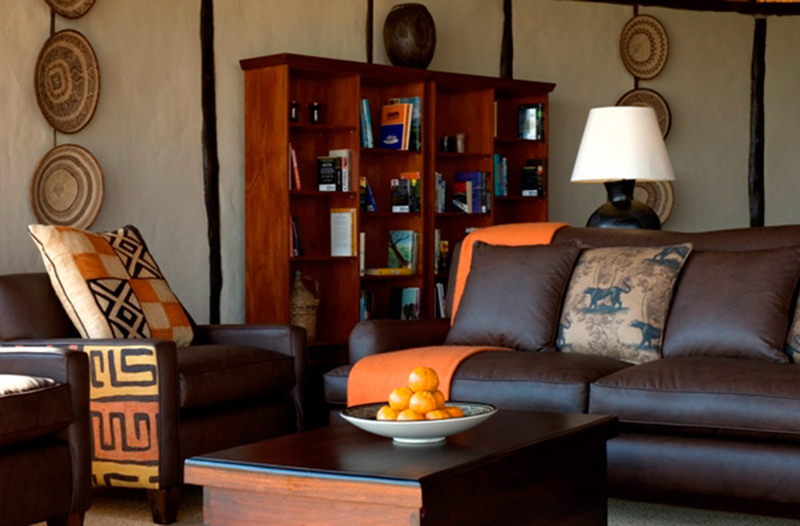 The total stay can be in one lodge or camp only, or be made up of shorter stays in two or more Sanctuary Retreats camps or lodges anywhere in Africa together. 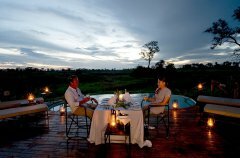 Stays in more than one camp or lodge do not need to be consecutive, but must belong to one itinerary. For example, if booking a total of 6 nights with Sanctuary Retreats in 3 different camps with 2 nights in each camp, use the ‘5 – 7 nights’ rates for each of the camps. There is no supplement for single occupancy of a maximum of 3 rooms/tents per camp/lodge (maximum 2 in Sanctuary Baines' Camp) in Low season (excludes Geoffrey Kent Luxury Suite at Sanctuary Chief’s Camp and the Honeymoon Suite at Sanctuary Chobe Chilwero). Children aged 6 and over are welcome at Sanctuary Baines’ Camp and Sanctuary Chief’s Camp. Children aged 15 and younger are required to share with an adult and are not permitted on walking safaris. A private vehicle must be booked for game drives for families including children aged 5 and under. One child aged 15 or younger stays free of charge in Low season when sharing with 2 adults, subject to availability of a triple room/tent. One or two children aged 15 or younger sharing with one adult in Low season pay the child rate. One child aged 15 or younger pays the child rate when sharing with 2 adults in Medium, High and Peak season, subject to availability of a triple room/tent. In all other circumstances children pay the applicable adult fare. One child aged 6 - 15 inclusive stays free of charge in Low season when sharing with a minimum of 4 paying adults, subject to availability of a triple room/tent. A second child aged 6 – 15 inclusive staying with a minimum of 4 paying adults pays child rate in Low season. One or two children aged 6 – 15 inclusive pay child rate when sharing with a minimum of 4 adults in Medium, High and Peak seasons. For example one child aged 6 - 15 inclusive staying with 3 adults pays the applicable adult fare in Low, Medium, High and Peak seasons. The rates for the Geoffrey Kent Luxury Suite include the following additional services at no extra charge: exclusive use of a game drive vehicle, private safari guide, private chef, dedicated waiter and housekeeper, and premium brand drinks and champagne. All cancellations should be made in writing and cancellation charges are calculated on the total value of the booking. Cancellations received from the date of booking to 61 days prior to arrival incur a 20% cancellation fee. Cancellations received from 60 days to 31 days prior to arrival incur a 50% cancellation fee. Cancellations received from 30 days prior until arrival incur a 100% cancellation fee. Additional fees apply for cancellation of airline tickets and other services which will be advised as soon as possible after receipt of the written cancellation. 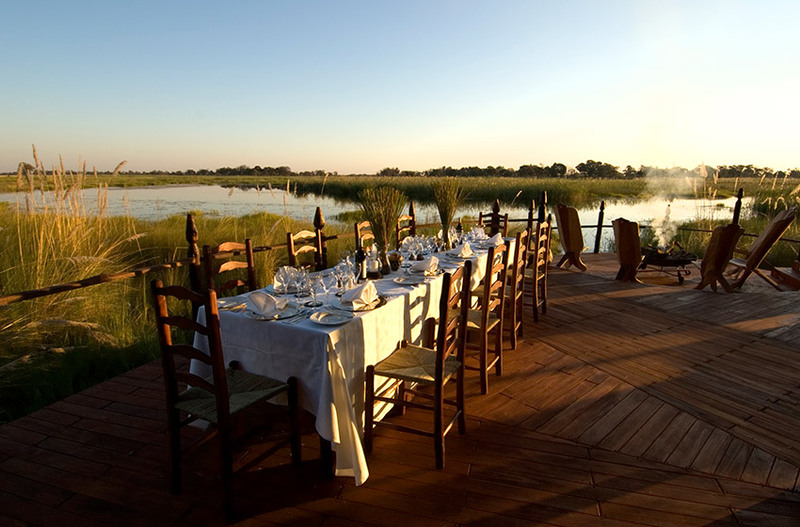 Special cancellation terms apply for group bookings and exclusive use of a lodge or camp and will be advised at time of booking. The fantastic array of wildlife here can be explored in 4x4 vehicles, by boat, canoe, or on foot. The delta has about 122 species of mammals, over 400 species of birds and 1300 species of flowering plants. Whenever you are visiting, there is always something to be seen from the wooden deck surrounding the main dining room. So don't be too surprised to see a hippo sleeping under your private viewing platform. There's also a good chance of seeing lion, leopard, buffalo, cheetah, giraffe, impala, zebra, wild dog and hyena. Elephants have been seen regularly recently at the camp which has been a real treat for the guests! Hippos have also made a regular appearance at the camp. Sightings of elephants and hyenas have been very high for guests while enjoying a Sanctuary Baines' Camp game drive! Lion sightings in the Delta have been rather good of late, with buffalo and antelope also seen regularly. Elephant, lion and hyena sightings were plentiful in June at Sanctuary Baines' Camp, much to the delight of the camp's guests. Buffalo, wild dog and leopard sightings were also quite good recently. Interesting sightings were: Some wild dogs were spotted eating impala close to the camp's airstrip. Plains game are plentiful and guests spotted lions, leopard and hyenas. Our guides also spotted two male giraffes fighting - this behaviour is shown as they try to prove their strength to the other males in the area. Our guides also spotted lots of beautiful flamingo. These stunning birds congregate in the wetlands each summer and can be seen in huge numbers. Predator sightings were excellent and included those of leopards, hyenas and lions. 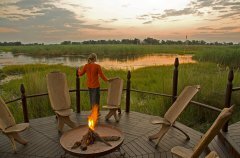 HEART OF THE DELTA : 5 night safari: The Okavango Delta, the largest inland delta in the world, supports a rich and colourful wildlife just waiting to be explored. Combine two of our Delta camps with this itinerary.